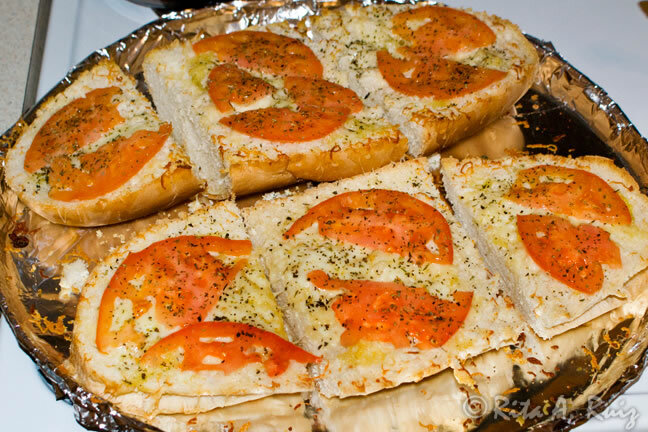 Here’s a great way to make bread into a delicious addition for soup or other meals, or an afterschool or Saturday afternoon snack while watching movies or football. Mozzarella cheese, plus one other kind of cheese of your choice. I like to use a creamy cheese called Vermont Cheddar Cheese by Hoffman’s. 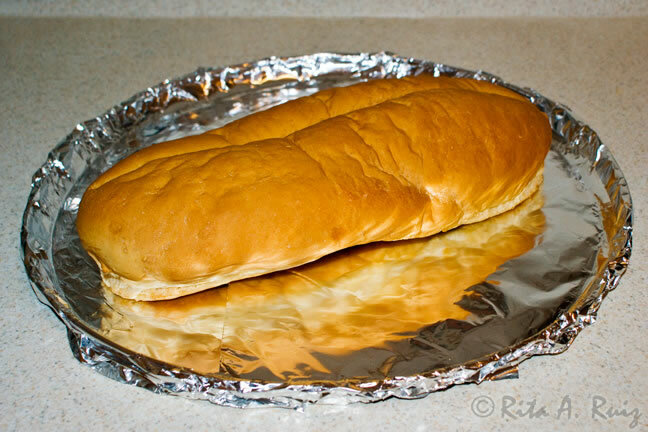 Aluminum foil to cover pan. 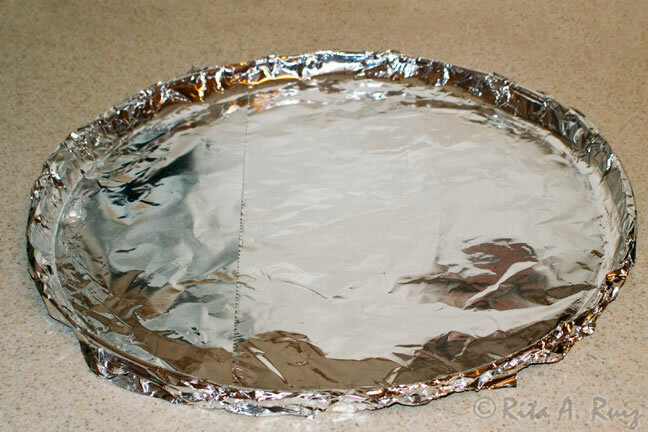 Use a large pan and cover with foil (or use a large aluminum disposable pan). 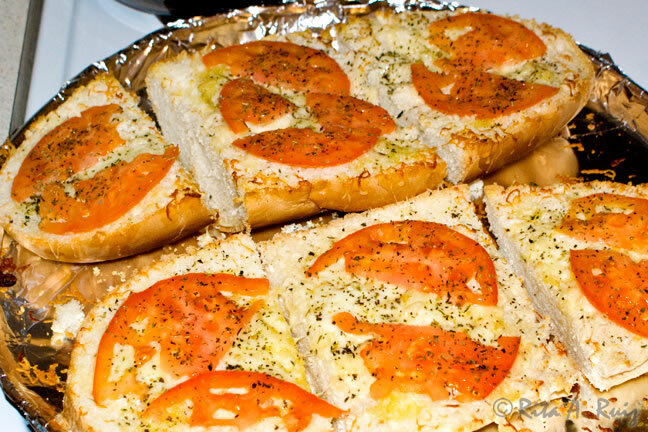 Take your french bread loaf and place on pan. You can buy this bread very inexpensively at most any local grocers. I can get it at Wal-Mart or Dillons, freshly made, for around $1 to $1.50. 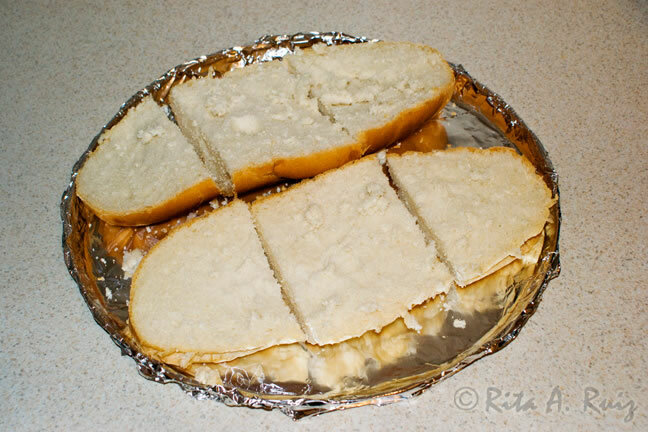 Now slice the bread with a serrated knife lengthwise from one end to the other. Now cut each of those halves into thirds. 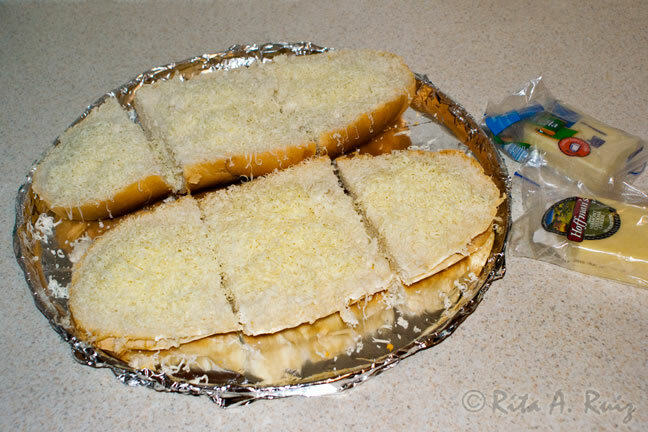 Don’t cut the pieces any smaller than that or when you put the cheese on, it will just get all over the pan into the sides of the bread slices. You can always cut into smaller pieces after it’s done cooking. However, I do like to cut it into at least thirds to make it easier to handle once it’s done cooking. 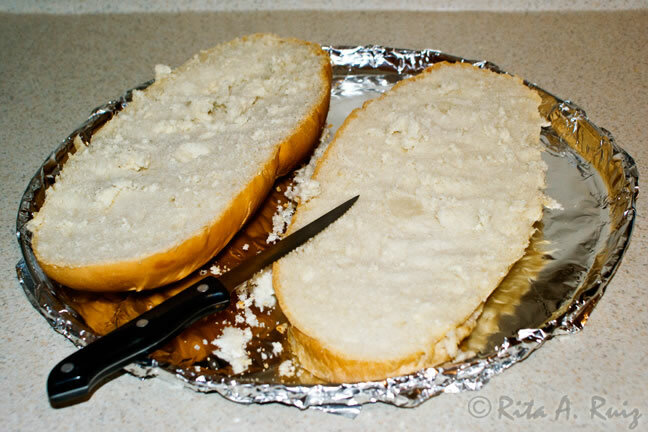 Now I grate the cheese directly over the bread. 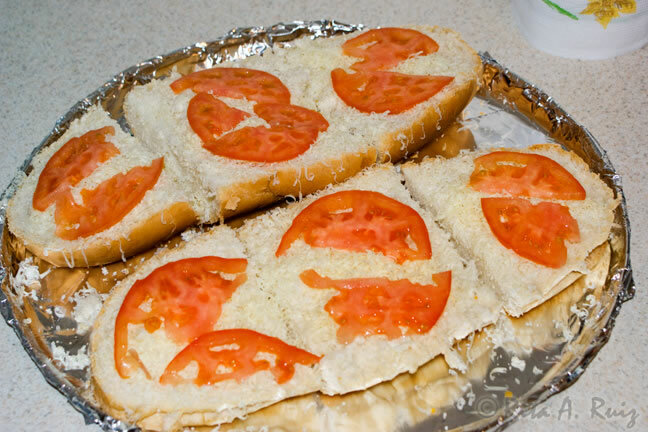 I start with the mozzarella, and then I add my favorite cheese over the top of that. 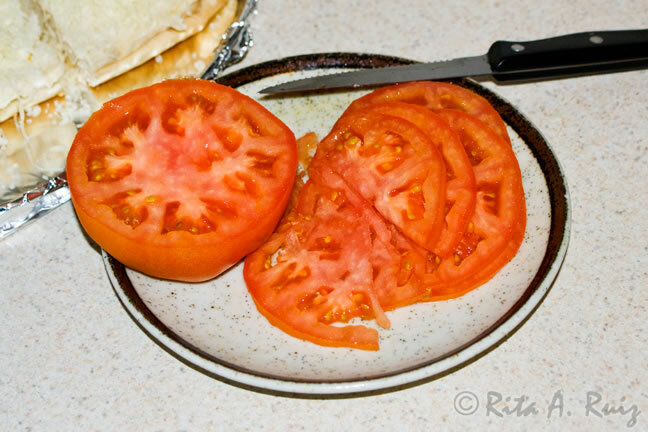 Slice your tomato into medium thickness slices, and then cut those in half. Place these on top of the cheese on every piece of bread. You will be using the olive oil and the Italian seasonings in the next step. You can use any kind of olive oil you like. 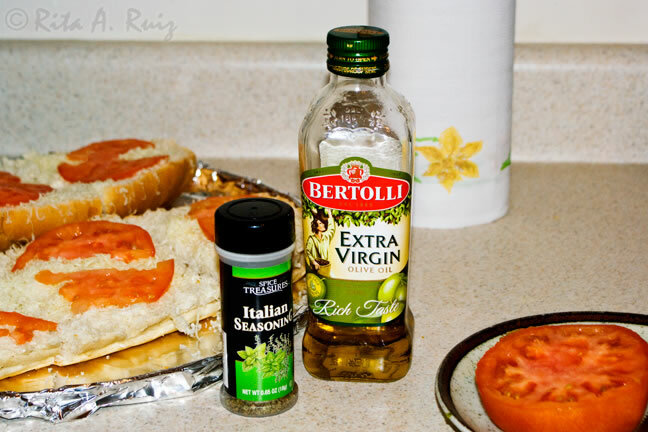 I like Bertolli’s Extra Virgin Olive Oil. It’s more costly, but there are some that are much more expensive. I have also used Wal-Mart’s Great Value brand and it is just as good and a lot less expensive. I’m a bargain shopper because I believe in saving where you can, as long as it’s not hurting you or putting your health at risk. But when I can afford the Bertolli’s, I get it. I also buy the really cheap Italian seasonings that I can get at the local discount bakery for very little. I have been a single mom for a long time and I have learned where to cut corners and still live decently. We love to eat at my house, and the cooking part is a great way for us to be together and talk about the day while we are in the kitchen. And that is just as important as the food we eat. 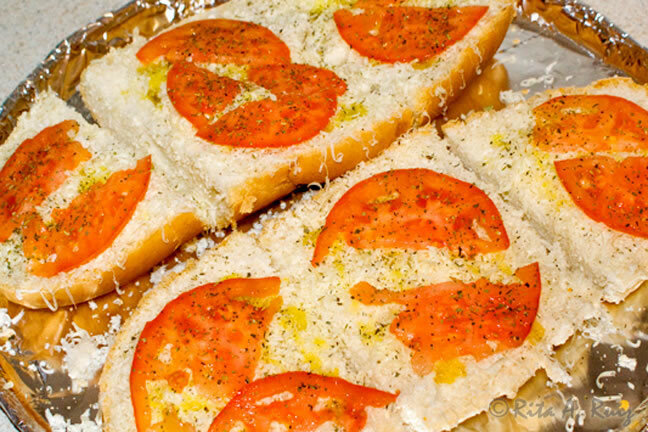 Now, drizzle the olive oil over the bread, cheeses, and tomato. Then sprinkle the herbs over the top. Be careful not to use too much if they are dried. The flavor is a lot stronger than you might think when using dried herbs and seasonings. Place it in the preheated oven and cook for about 5 minutes. I don’t usually measure things or time my food. I go by the smell. When things start to smell so good you can make the kids come out of their bedrooms and away from their computer, T.V., Playstation and all their other technical devices, then you know it’s probably done and you’d better check on it! Take it out of the oven and serve it with some soup or a quiche or all by itself!